TreeIter pointing to the superordinate row. The TreeIter of a cell is obtained by calling the get_selection function of the automatically generated GtkTreeSelection widget. 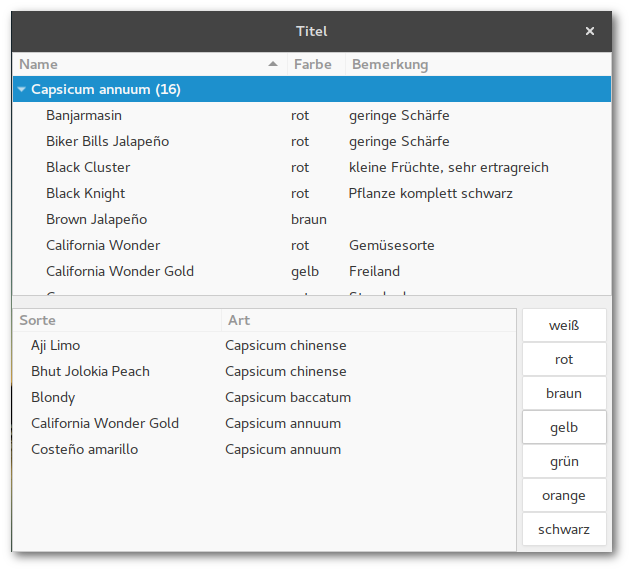 In the example there are two TreeStores with some columns and the coresponding TreeView widgets to display the data columns. Sorting a column is set by calling set_sort_column_id. If this is applied to the TreeStore all TreeView widgets using this store are equally sorted. If this behaviour is not diesired TreeModelSort elements come into play and which are "interposed" between store and view widgets. First the TreeModelSort is created via "Miscellaneous > Tree Model Sort" from the widget sidebar. Then you choose a source TreeView to use data from. After that the model in the TreeView widget is replaced by the newly created TreeModelSort. The sort function is now simply applied to the TreeModelSort object instead to the TreeView object. TreeModelFilter allows to only show data that matches the specified filter criteria. Handling this object is analogue to TreeModelSort. In the example the varieties can be filtered according to fruit colour so there is a GtkButtonBox required to put the corresponding buttons into. Besides the columns containing displayed data there is a "weight" column in the first TreeStore. This value is used to show the cell in bold text. It is realized by setting the CellRenderer's property of "Font weight" to the column containing the corresponding value (normal font is 400). In this way the appearance of cells can be defined, for example colours or font formating.